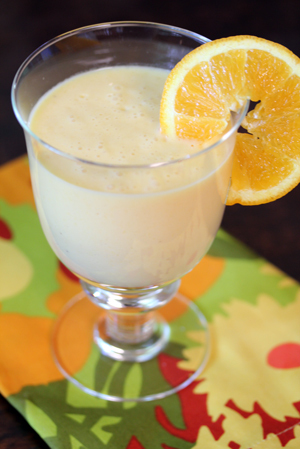 While I normally make them with milk or yogurt, but when asked to come up with a recipe using Sunkist® Valencia Oranges, I thought a “dessert” smoothie was in order. Substitute milk/yogurt with ice cream…and voila…a dessert smoothie! OK…but first…have you heard of “re-greening”?!? I haven’t/hadn’t. But I know what it means now! Sunkist® Valencia oranges may occasionally “re-green” in warm weather. When Valencias ripen on the tree, they turn a bright orange color but warm temperatures may make their skin reabsorb chlorophyll as they hang on the tree causing the orange color to look partly green—although the outside is green, the inside remains ripe and delicious! You can learn more by watching this quick video about the process. Fresh Valencia juice may be squeezed and refrigerated overnight. If tightly covered and immediately chilled, no loss of flavor or Vitamin C will occur. Say “Valencia!” Valencias especially good to eat when cut into “smiles.” Cut fruit in half crosswise; then cut 3 or 4 wedges from each half. You can find additional Sunkist citrus recipes …now get to sneaking in these Vitamin C packed orange gems in more places than your dessert smoothies! Peel the oranges (see video above). Add all the ingredients to a blender and puree. I agree with [email protected] that freezing bananas before using them in a smoothie makes almost every recipe better by reducing the amount of water or ice required. This looks like a great smoothie recipe. I love the color!!! I guess folks who don’t want to use too much ice cream for some reason, could replace part of it with something like almond milk? This is my kinda dessert – not too rich and really simple to make. Thanks!